Smack Jeeves Forums • View topic - "View Unread" button? I noticed a bug where occasionally my favorites will show that there are unread comics, but I have to scroll way down in the list to find which one is marked "new". Maybe that's user error on the part of those authors, like if they change the date on certain pages, or something? But I was wondering if it would be possible to show a list of everything in your favorites that has unread pages. I think I prefer the old system where it displayed uploads by time rather than by position in the archive. Oh, I think I phrased my suggestion poorly. I meant that I have to scroll way down in my Favorites list to find which comics have posted updates marked as New. I was hoping for a view that would show me which comics those are; once I find them I can generally find the new pages (and/or find that pages that had already been posted before somehow show as "new" again... but that's another story). Oh! In both the favourites drop-down and on the favourites page, the recently updated (=unread) comics are all at the top in addition to being marked as "new", so it's easy to find what has updated recently. Or do you leave some older comics unread and thus end up with a mix of read and unread near the top, making this system not work for you? The problem is, occasionally comics will show as New, even though they're not toward the top of the list. - The author uploads a page, but sets the date to the past, for some reason. - There's a bug where pages I've already seen get re-marked as New even though it's been a week or more since the comic actually updated. 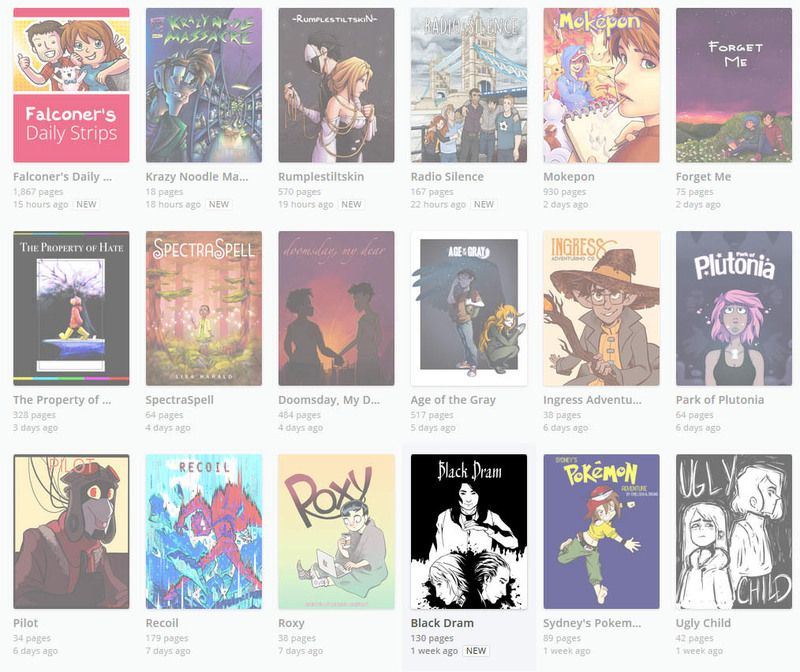 - There's a bug where the page doesn't get marked as New right away, so I don't notice there are unread pages, and it fixes itself later when the comic has fallen down the favorites list. Those are just ideas of possible root causes; the actual problem might be a combination of those and/or some things I haven't thought of. My suggestion would just be a workaround, but it sounds like you haven't seen the problem at all. Maybe it doesn't happen for very many people, and wouldn't be worth investigating? I don't use the Favourites page at all, I use the dropdown, so it's possible the problem happens on the page but not the dropdown. Have you noticed particular webcomics being involved in these issues, or is it all the comics you follow? It sounds like a problem worth investigating and fixing instead of making a workaround. Workarounds are for problems that can't be fixed. Perhaps you could reword your OP to that effect and I can move this thread to Bugs & Glitches? I've seen it for a few comics... Yesterday I noticed it for Galebound, and I saw it once for MYth. I saw it a handful of times on Comicide; that one isn't on my favorites at the moment so it's possible it's continued to happen. Also there were a couple times a while ago when it happened but I gave up on finding the comic it was happening for and I just hit "Mark all as read" so the unread indicator would be useful again. eishiya wrote: Workarounds are for problems that can't be fixed. I agree, and my impression is that this might not be possible to fix, if it's due to authors' behavior. @eishiya: Conveniently, I noticed this issue with Black Dram this morning, so maybe you have an idea of what happened! Black Dram was showing as "new", but the last update was from last week so it's pretty low in my favorites list. sentiashinou wrote: @eishiya: Conveniently, I noticed this issue with Black Dram this morning, so maybe you have an idea of what happened! Black Dram was showing as "new", but the last update was from last week so it's pretty low in my favorites list. I actually had the same thing happen to me with Black Dram as well, just to confirm that it was not just one person seeing this. I've seen this too, so I suspect it has something to do with a page being queued up but not actually accessible to the readers yet. Screenshot under the spoiler. That's probably because I accidentally set the page to release when I uploaded it, and then went and edited it to release later :'D So, that's a derp on my end rather than SJ's fault. eishiya wrote: That's probably because I accidentally set the page to release when I uploaded it, and then went and edited it to release later :'D So, that's a derp on my end rather than SJ's fault. Oh, that's good to know. So SJ just doesn't unmark comics as "New" when the unread pages are removed or hidden. I haven't tested it, but it's likely it might unmark them if the pages are deleted, but not when the dates on them are changed.